How do I sync Google Analytics? 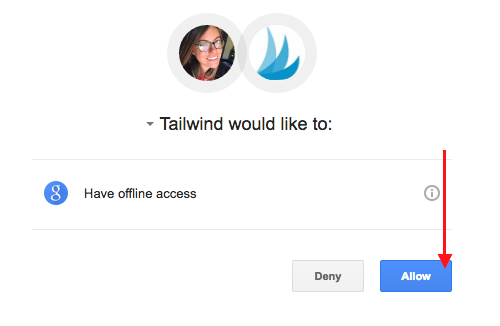 Get more metrics and data by syncing your Google Analytics with Tailwind. Like many small businesses, bloggers, and brands you might use an external Referral Traffic reporter such as Google Analytics. You can sync GA within your dashboard to pull in referral traffic from Pinterest directly into Tailwind. Syncing your Google Analytics account will add additional features such as Traffic Metrics, E-commerce Transactions, Revenue attributed to Pins and Pinners, and Improved Data Accuracy. Integrating Google Analytics takes less than 30 seconds! 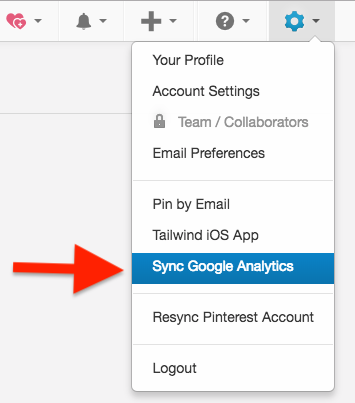 Go to Sync Google Analytics (located in the settings menu in top right hand navigation) in the Tailwind Dashboard. 2. Click the blue Integrate Google Analytics button. 3. Click Allow in the Google authorization popup. 4. Back in Tailwind, a green banner will appear showing that you've successfully synced your Google Analytics profile. Hooray! 5. Finally, if you have multiple profiles within your Google Analytics , you'll want to select which profile you would like to use for tracking your Pinterest traffic and revenue. We'll likely choose the best one for you, but make sure we have the right one. Don't forget to save!